It's official. 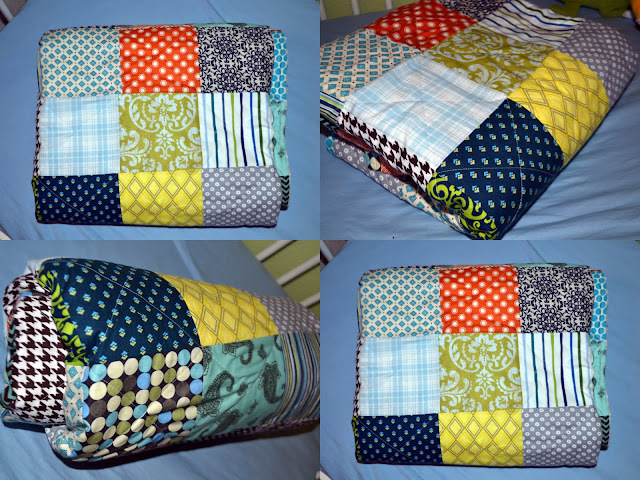 I've made my first quilt. This may not seem like a super huge deal, but for me, it was. 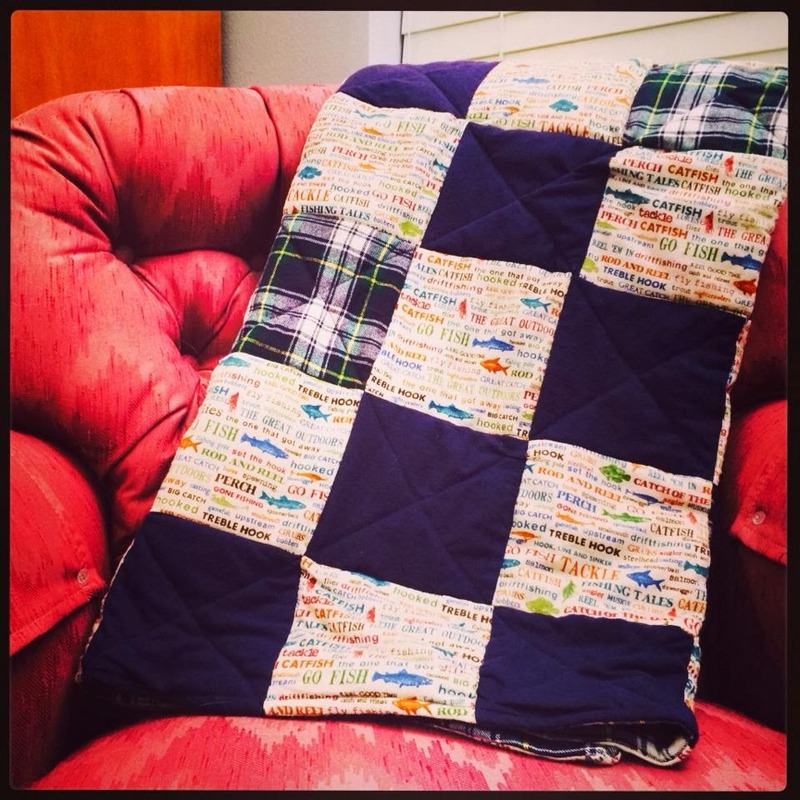 My mom is a quilter and excellent at sewing. I do good to make straight lines and not get the thread all bunched up under the bobbin. For the longest my mom has been putting the ever slightest amount of pressure on me to learn to quilt...The thing is, I am a do-it-yourselfer. I didn't want her to teach me. Head-strong, maybe. Stubborn, yeah. But I wanted to be able to say that, "I did it!" Me. All by myself. Well. Me and the internet. :) Check out the tutorials I followed at the bottom! Christmas morning my dad opens his gift and says, "Judy, thank you for the quilt." And my mom says, "I didn't make you a quilt. You'd better see who it's from." 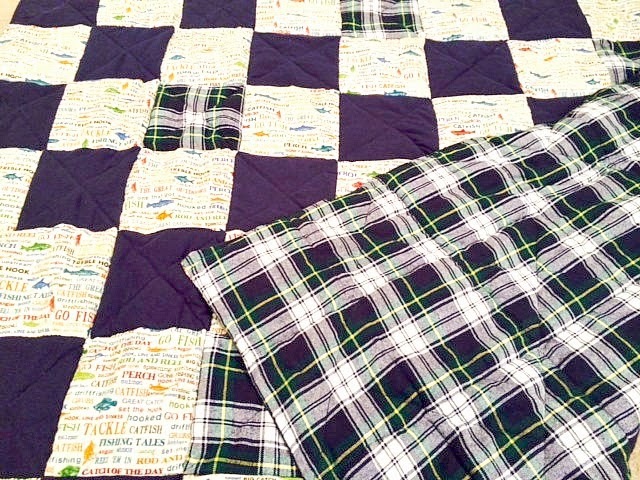 And then all astonishment and amazement and wonder from Mom and Dad at the little lap quilt I made. So I picked out some comfy flannel with fish and plaid and blue. Something useful and warm for my dad when he's sitting in his recliner watching the Texan's lose. Don't be sad. They are setting a record. Here it is! This is the quilt top. 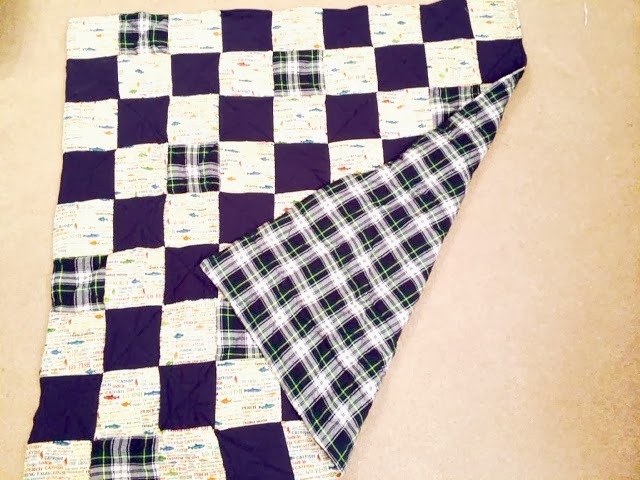 The backing was solid plaid. To be honest, close to the end I did ask my mom's advice. I couldn't keep picking out my stitches and not go crazy!!! I have never machine quilted anything in my life, and it wasn't going well. She suggested I sew thick thread or yarn in the corners and tie them off to finish. I thanked her for her advice, and then did my own thing. I really wanted to prove to myself that I could do this. So, I kept at it and "stitched in the ditch" down each row. Then I went diagonally down the solids and plaids in each direction creating an X effect. Next I'll make my own. I picked up some pretty red poppies fabric. I'll show you when I'm done! Here are the 4 tutorials that I flipped back and forth between for my inspiration and guidance. Thanks so much! The Smores. Party of Four. Check them out! They helped a beginning of the beginning beginner make a quilt. They can help you too!